The Freshdesk integration allows you to import and track time on all created tickets. Manage your time and generate valuable reports by monitoring how much time you need to take care of reported issues. Find Freshdesk on the list of available addons and click on “Enable” button. On a separate bookmark, login to your Freshdesk account. We’ll need to copy your API key from Freshdesk – unique to each user. Click on your avatar in right-upper corner to expand drop-down menu. Enter “Profile Settings” page. We’ll also need Helpdesk’s name you’ve chosen while creating it. If you’re not sure what it is, take a look at URL address in your web browser, after logging into your Freshdesk account. We’re looking for the part before ‘.freshdesk.com‘ (3). Memorize this one. Your API key is located on the right side, under the password change panel. Copy it. Enter previously mentioned helpdesk’s name and paste your API key on integration’s settings page. Click on green “Enable the integration” button. TimeCamp will automatically import all of your tickets. From now on you will be able to track the time spent on each assignment. Go to Project Management page. Note that tickets are already there, under the main project simply called “Freshdesk”. 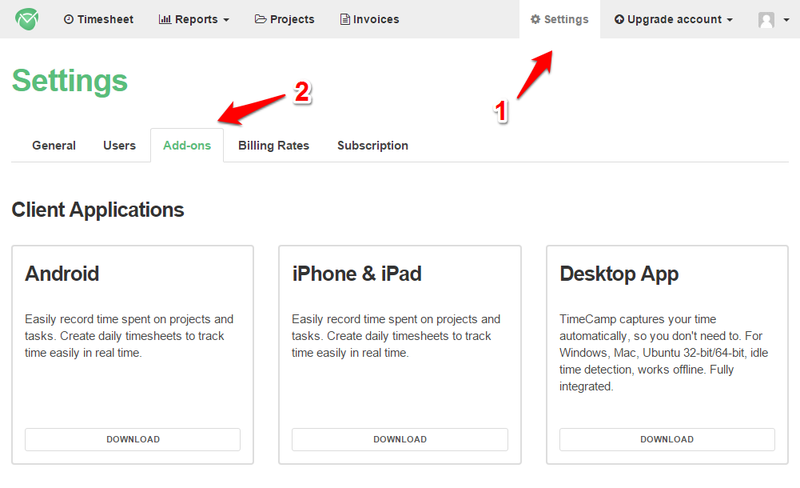 You can now track time using TimeCamp’s timesheets, or using our mobile or desktop applications.